One of the many spiritual laws that serves as the basis of most religious faiths and spiritual practices is the Law of Least Effort. According to this principle one should do all things without struggle--do what you can and allow God, nature, and the natural course of life to work out the details, depending on your belief system. If you're a Christian surely you've heard your pastor and peers say "let go and let God." If you look up the word Islam you'll find it actually means "surrender." In the spiritual self-help world Deepak Chopra has been a champion for the Law of Least Effort. In fact, it ranks number four in his book, The Seven Spiritual Laws of Success. Chopra, who is known for blending spiritual teachings with physics, psychology, and philosophy, reminds readers that in nature everything is designed to operate with effortless ease: the sun doesn't try to shine, it just does. But in an era where racial injustice has inspired the need for a new brand of social activism, how do we apply this law to our daily lives without feeling complacent? 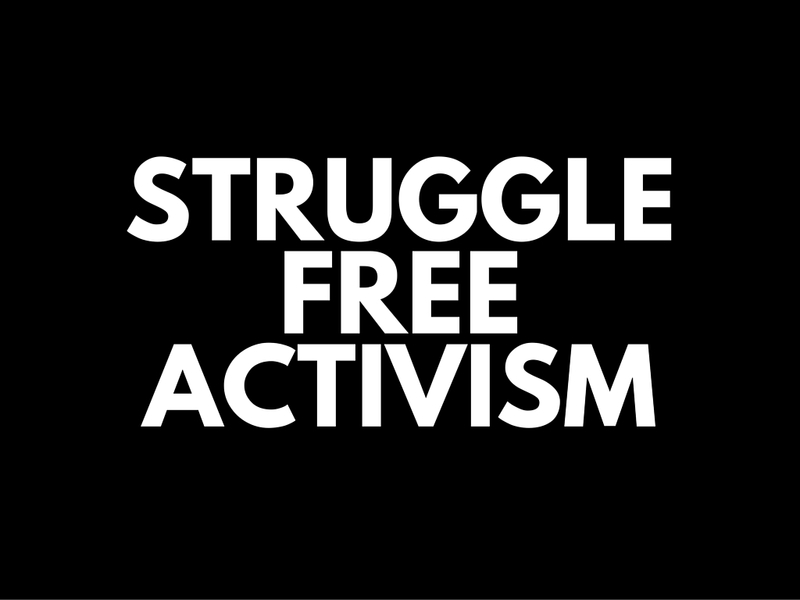 The word activism itself is at times synonymous with words like "fight" and "resistance." As black men and women continue to fall at the hands of law enforcement who receive little to no consequences, how does one "stay woke" without going ballistic? "Does the concept of least resistance or effort mean that we do less or focus less or put in less effort? No, the concept of least effort encourages one to take conscious action and to exert effort without struggle," says Maya Breuer, Certified Yoga Instructor (E-RYT 500). For the past 25 years her approach to activism has been to actively teach yoga to the black community. She explains that the ancient Indian practice is also largely based on the Law of Least Effort. For example, practitioners are encouraged to relax into a pose and allow the breath to guide them, rather than forcing the body to stretch further than it can. Breuer believes spirituality has always been at the forefront of black activism. "If you look at the history of African Americans we have been through other challenging periods, Slavery, Jim Crow, racial killings, just for being black, and there were always activists working and living in those times as well," says Breuer. "At that time yoga was not heralded as a practice among African Americans but I believe the tenets of the practice lived intuitively and naturally in the hearts and minds of Black activists. Through their faith and connection to the divine they were able to create their own brand of attentiveness and ease." Activists like Dr. Martin Luther King Jr. and Frederick Douglas were both known for their very strategic and transcendent approach to working towards the establishment of racial equality, whether through art or organized action such as bus boycotts. Today's activism is mainly driven by social media, which has been instrumental in gathering and arousing people seeking knowledge and ultimately a change in the system. But for a generation that hasn't dealt with legal segregation, lynchings, and direct enslavement, today's back-to-back racial tragedies may come as a slight shock to the psyche, causing the kind of long-term stress that requires tactical methods of healing. "First take care of body, mind and spirit," Breuer advises to those taking on any level of activism. "Use self-awareness and the concept of attentiveness and ease in all efforts to bring about change." If you're interested in learning more about how to use yoga as a method of physical and spiritual healing, Maya Breuer shares her knowledge on the practice. The first step is to incorporate these practices into one's life to live well. There are three aspects to this practice, and they respectively nourish each aspect of self--body, mind and spirit. 1) Tapas which is taking care of the body with physical exercise, yoga practice of physical postures, and eating a balanced healthful diet. 2) Svadhyaya is allowing oneself to study the self- to use sacred texts, the bible, and even some contemporary works to help one to understand life and understand self. 3) Ishvarapranidhana- which bears the literal translation of not my will but thine oh, lord. In layman's terms it easily translates into letting go of the results of your actions. Here we express our diligence by doing what we need to do in a given situation then letting the results and putting it in the hands of the lord. When one brings these three practices into ones' daily life voila, the body, mind and spirit come into balance and this practice promotes clarity and therefore conscious action.